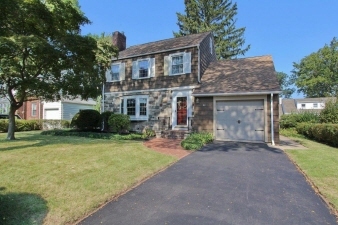 Charming, Quality Built 3 BR Colonial showcases beautiful details of old world craftsmanship including crown molding, built-in bookcases, 2 fireplaces, crystal doorknobs and beautiful hardwood floors protected by carpeting. This home has been extremely well maintained & updated with newer gas furnace & stainless steel flu liner, ductless AC on 1st fl, newer HWH, partial newly finished basement with updated electrical wiring, roof 14 yrs old, newer appliances & more. Great layout and lots of storage. Ideally located moments to shopping and transportation. Make this lovely home yours today! Crown molding, upgraded trim, crystal doorknobs, 2 fireplaces, built-in's, hardwood flooring protected by carpeting, gas furnace '12, HWH '12, stainless steel flu liner '12, Sanyo ductless AC on 1st fl, new dishwasher & newer stainless steel gas stove & range hood, microwave, washer, dryer, partial newly finished basement with newer electrical wiring.